Asia’s largest Bollywood Music Festival, Gaana Bollywood Music Project (BMP) is back with a bang in its second season. After witnessing tremendous success in its first season in 2016, Gaana BMP, in its second season will be back in the capital. Gaana BMP is organized by Event Capital (A Laqshya Media Group Company) and TM Talent Management. The festival will be held at Jawaharlal Nehru Stadium Grounds on 27th and 28th January 2018. In the second season of Gaana BMP, Bollywood music fans across Delhi will witness a line-up of over 50 artistes performing live on a multi-genre, multi-stage format. 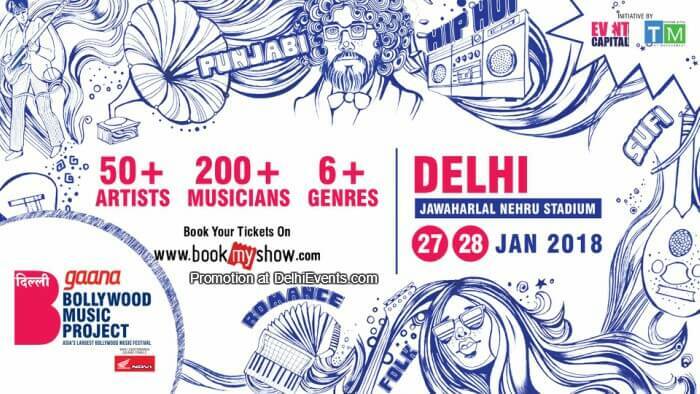 The festival will see a specially curated act by Benny Dayal & Funktuation Ft. The Horn Flakes New-age star of the Assamese folk-fusion scene and popular Bollywood singer Papon, rapper Raftaarwill also be performing at Gaana BMP Delhi this January. There will also be a special gig by The Trio Divya Kumar, Mohammed Irfan and Shefali Alvares who will be performing their famous songs under a specially curated act called BollyYouth. Gaana Bollywood Music Project will also witness sufism at the festival with popular devotional and sufi singer Richa Sharma as well as the Nooran Sisters. The second season promises to be grander with live music performances across popular music genres like Sufi, Punjabi, Commercial Bollywood, Indi-pop, Funk, Rock Qawali and many more flavours of Bollywood Music. Singer, song writer and composer Benny Dayal, said “This is the first time I will be performing at Gaana Bollywood Music Project. This is a very unique and interesting IP curated by Event Capital and TM Talent Management which will allow every Bollywood music lover to experience performances by their favourite singers under one roof. Gaana BMP is trying to get in all flavours of Bollywood at one festival which has never been done before and it will be a great pleasure to perform in Delhi. The famous Trio Divya Kumar, Mohammed Irfan and Shefali Alvares expressed that, “We are very excited to be a part Gaana BMP this year as well. We had received immense love from the audience last year and this year, the audience will see us in a new avtar in s special curated section called BollyYouth”. Mr. Tarsame Mittal (Founder of TM Talent Management) said, “The response we got for our first season in Delhi was so overwhelming that we are back this year with a bang we have carefully curated and designed the entire festival keeping our lovely audience in mind. From Punjabi to Sufi to Rock to Indie-pop, Gaana Bollywood Music Project has something for everyone. We are so looking forward to presenting Gaana Bollywood Music Project to Delhi again and will ensure everyone will have an experience of a lifetime."